Many people have walked up Africa’s highest peak, Mt Kilimanjaro, but not many have done it with onlyt one leg. But Capetonian Zizipho Ndlwana, whose leg was amputated below the knee after a car accident in 2010 when he was 19-years-old, climbed the mountain four years later. He was the first black amputee to conquer the 5.8km-high peak. That same year, he again strapped on his prosthetic leg and competed with a wheelchair-bound colleague to cover the 50km distance from Cape Town to Big Bay. Of course it wasn’t about winning but completing the challenge. Now aged 25, Capetonian Zizipho Ndlwana, a public relations, events and business management lecture at Cape Peninsula University of Technology (CPUT), has accomplished things many able-bodied people don’t dare. “I want to be an extraordinary person. I have accepted my disability. I don’t regret losing my leg. It made me a better person. I’m more aware of myself and people surrounding me . It opened my eyes to a whole lot of things. 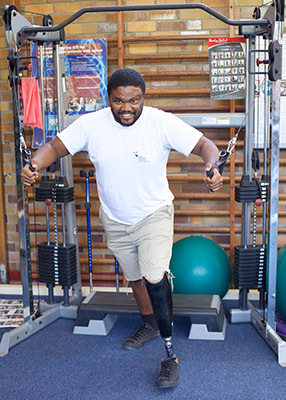 If I had another chance I’ll be an amputee again,” said Ndlwana. On 31 August 2010, the tyre of the car he was driving burst, causing it to roll. He was in a coma for a week before waking up in Groote Schuur hospital to discover his leg had been severed. He had to receive hospital treatment for a further five months. “I was not upset when I woke up to see I had one leg. I was focussing more on that I’m still alive,” he said. He has since maintained that attitude and has not let the loss of a leg limit his ability to enjoy life. “I’m on a mission to defy odds and motivate people. I want to prove to everyone else that there are no limits in life,” he said. Before the accident, he was an aspiring Springbok rugby player. But his dreams were not completely dashed. He switched his focus to athletics and dares feats even able-bodied persons struggle to achieve. “ I did not sit down and give up in despair when I lost my leg. It’s not that I can’t play rugby, it’s just that I can’t play it like before when I had both legs, but now I found something that I love and I’m embracing it,” he said. He said callous comments by people towards disabled people made him angry.